↑ R. W. McColl, संपा. (2005). 'continents' - Encyclopedia of World Geography, Volume 1. प. 215. ISBN 9780816072293. पहुँचतिथी 26 जून 2012. 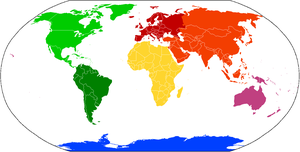 And since Africa and Asia are connected at the Suez Peninsula, Europe, Africa, and Asia are sometimes combined as Afro-Eurasia or Eurafrasia. ↑ 5.0 5.1 "Continent". एन्साइक्लोपीडिया ब्रिटैनिका. 2006. Chicago: Encyclopædia Britannica, Inc.